For some people a great view can enhance a hotel room immensely. Others may not put this aspect of their stay as far up the list of importance but are still willing to acknowledge that a venerable vista is an added bonus that they would be pleased to have. Whether it’s a front row seat for a famous landmark, a vibrant vantage point across rolling hills or simply a prime spot to admire the cityscape; excellent views put hotels in demand. Here are some great examples from around the world where your hotel room may well provide the best seat in the house. If, for you, a great view is all about witnessing nature in all its glory, then this hotel in Chile will knock your socks off. 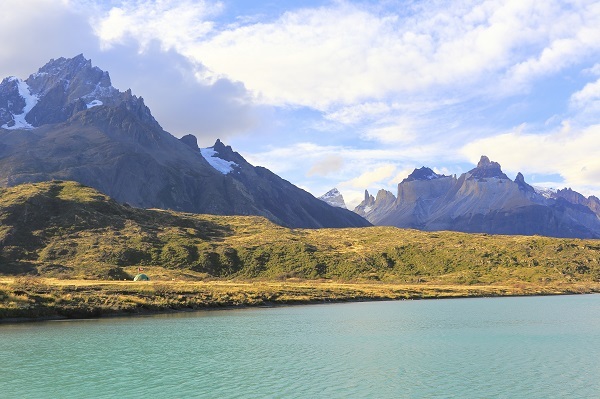 It is situated right in the middle of the Torres del Paine National Park and has the breath-taking Paine Mountain and idyllic Lake Pehoé as its backdrop. Life here couldn’t be more peaceful and a walk amongst the lakes, ice fields and glaciers is a must for any visitor. The hotel breeds its own horses for people to use during their explorations of the area, and there is a luxurious bath house waiting to sooth those weary limbs on your return. 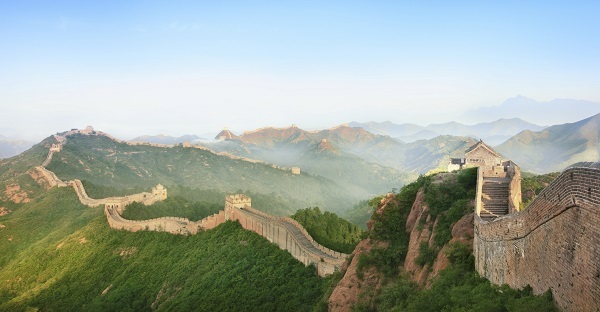 When it comes to the world’s most famous landmarks, somewhere near the top of the list has to be the Great Wall of China. Thousands of tourists flock to different points along the Wall’s 5,500 mile length just to catch a glimpse of this historic piece of architecture, but anyone staying at this hotel doesn’t even have to leave their room. What’s more, there’s also a private path by which you can access a tourist-free section of this wonder of the world. Whilst suites can become your own personal haven, guests are encouraged to socialise in the dining and sitting areas. Each of the 40 villas at the Commune was designed by one of 12 talented architects and has been created with positive Zen in mind. There are Four Seasons Hotels all over the world, each offering its own slice of luxury for anyone lucky enough to stay. 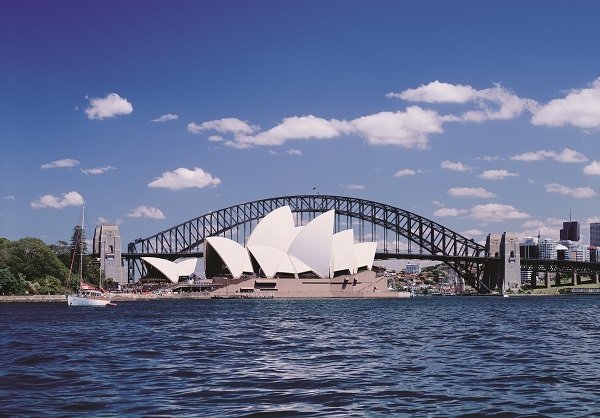 However, the one in Sydney has arguably the best location of all of them. Overlooking the harbour, guests can marvel at the Opera House and Sydney Harbour Bridge from their own bedside, whilst the view from the Presidential Suite is even more spectacular. If you can tear yourself away from the window, there is also a heated swimming pool, holistic spa and executive club lounge to make you feel like royalty during your trip. After reading this list you may be thinking that all the natural beauty in the world is restricted to South America, but we just had to include this stunning view. 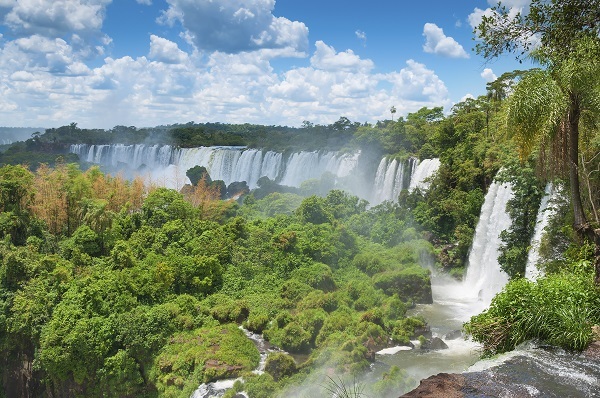 Brazil has plenty of scenic areas but the powerful Iguazu Falls, lying on the border with Argentina, is possibly the most impressive sight. The Belmond Hotel das Cataratas has specific ‘falls view’ rooms from which guests can watch the thousands of gallons of water cascade down the mountainside every second. Anyone staying here also receives exclusive access to the sights around the falls (and the falls themselves) all day, including before and after the rest of the crowds turn up. The hotel is just a fifteen minute walk from the most vociferous part of the falls, known as the Devil’s Throat, and there are plenty of rafting and helicopter tours available in the area. 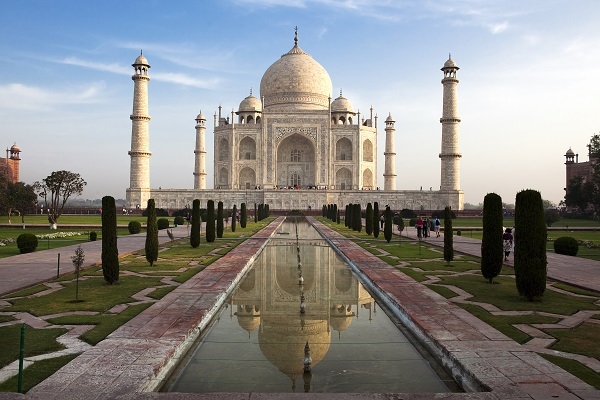 The Taj Mahal is one of the most recognisable structures in the world and one of the most beautiful too. However, there is no need to brave the busy streets of Agra when you can get an unobscured view from your room at the Oberoi Amarvilas…and the lobby… and the spa… and the restaurant… and the open-air bar. In fact, this elaborate tomb built by Emperor Shah Jahan in memory of his wife is visible from just about anywhere in the hotel. Guests can also enjoy a romantic meal on their room balcony or by the bucolic poolside. And if you would like a closer look at the Taj Mahal then the hotel offers complimentary golf carts which will take you the extra 600 metres. If you value a room with a view then Fred.\ Holidays can tailor-make your holiday with this in mind. Call and speak to our friendly team of specialists today and you could soon be admiring the perfect panorama.